Healthy Now and Later: Stoping and Smell the roses to check your chances of Alzheimer's. 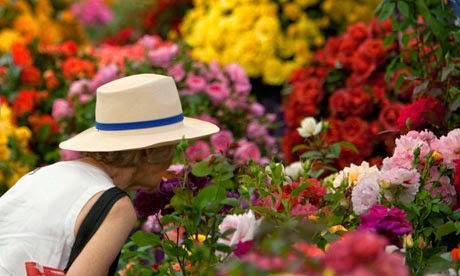 Stoping and Smell the roses to check your chances of Alzheimer's. Research has discovered that a poor sense of smell may be one of the earliest signs of Alzheimer's Disease. “Understanding smell loss, we think, will hold some clues about how to slow down this disease,” said Daniel Wesson, assistant professor of neuroscience at Case Western Reserve and lead investigator for the study, which was published in The Journal of Neuroscience. Loss of the sense of smell can be caused by many conditions other than Alzheimer’s, including medications, viral illnesses or injuries to the olfactory systems. But a poor sense of smell has also long been recognized as an early sign of Alzheimer's. It may also be an early sign of mild cognitive impairment, a form of memory loss that sometimes precedes Alzheimer's. Not all people with Alzheimer’s lose their sense of smell. Mice exposed to a very minute amount of beta-amyloid lost their ability to detect odors. Plaques made up of the toxic proteins appeared in the rodents' brain areas responsible for smell long before they showed up in areas important for memory. The mice spent more time sniffing than usual but became incapable of remembering smells or telling the differences among odors in lab experiments. Like the mice in the study, people with Alzheimer's may have a poor sense of smell and be unable to detect common odors like natural gas or roses. But no drugs are currently available that clear beta-amyloid from the brain, though scientists continue to test new candidates. The problem: a decreased sense of smell is a natural sign of aging according to Dr. Paul Takahashi at the Mayo Clinic. "Some loss of taste and smell is natural with aging, especially after age 60," Dr. Takahashi explains, "and although you can't reverse age-related loss of taste and smell, some causes of impaired taste and smell are treatable".